RAYMONDVILLE — A sheriff’s deputy rolled up on the scene to find a parked 18-wheeler and two state trooper vehicles. 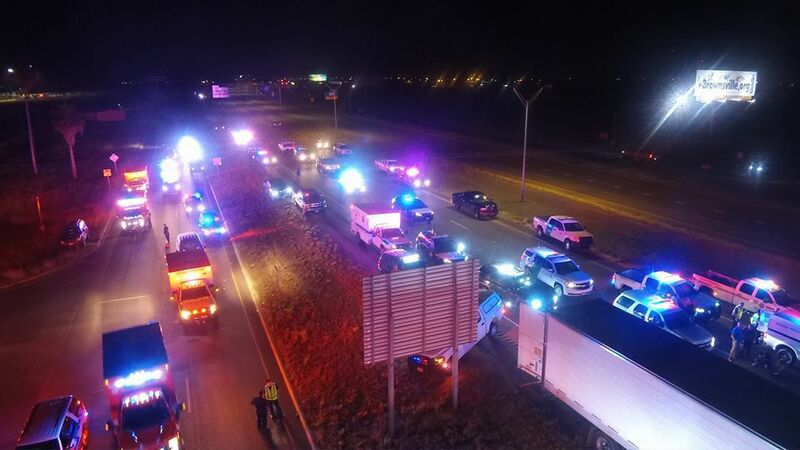 It was the dead of night on a stretch of Interstate 69 near Raymondville. As the deputy stood at the scene, he heard a loud bang come from inside the trailer. Then undocumented immigrants broke a hole in the trailer’s roof, allowing several of them to climb out onto the top. U.S. Border Patrol Carla Provost acting Chief speaks during a press conference after 86 undocumented immigrants were found inside a semi rig stopped in Willacy County Tuesday night. 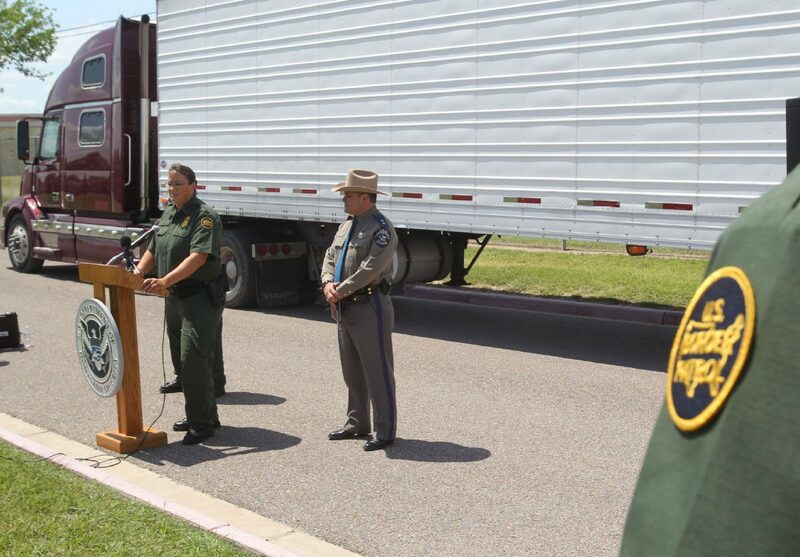 An eighteen wheeler on display during a U.S. Border Patrol press conference Wednesday, May 23,2018. Eighty-six undocumented immigrants were found near Raymondville late Tuesday evening hiding inside under produce. Before the night was over Tuesday, 86 undocumented immigrants had been detained. Spence called it one of Willacy County’s biggest human trafficking cases he can remember. And he’s been sheriff here since 1985. 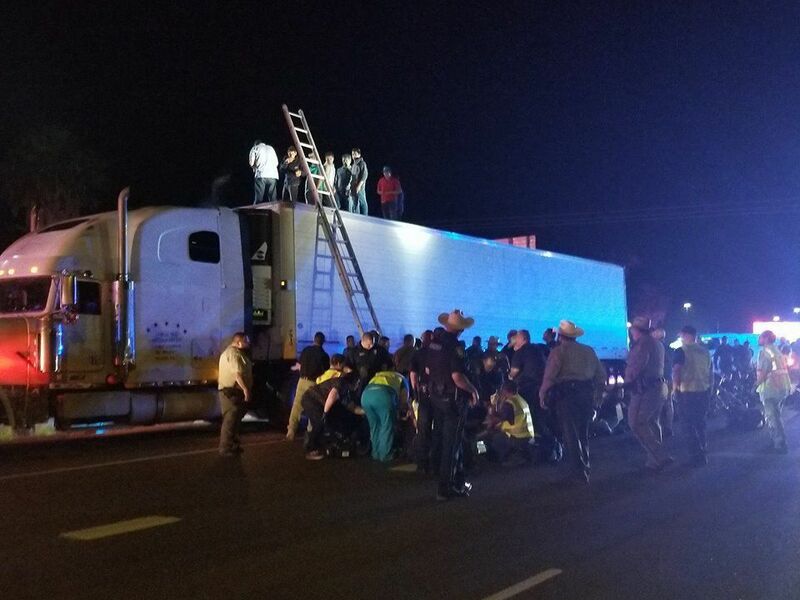 The Department of Public Safety troopers made the stop some time after 10 p.m. after receiving a tip from a concerned citizen about possible human cargo inside an 18-wheeler. The troopers identified the northbound tractor-trailer and pulled it over near the State Highway 186 exit. Before long, the truck was surrounded by DPS troopers, Border Patrol agents, Willacy County sheriff’s deputies and Raymondville police. A U.S. Customs and Border Protection helicopter was also called in, as well as BORSTAR agents and EMS crews. Northbound traffic had to be routed around the scene. Spence said local EMS put out a call to surrounding EMS for assistance just because of the number of people in the trailer. The crews wanted help in checking the health of the people “just in case,” he said. The first deputy on the scene reported that undocumented immigrants said a child was “very sick” and needed medical care. Two suspected smugglers were arrested. The immigrants were determined to be from Honduras, Guatemala, El Salvador, Mexico and Nicaragua. “All subjects will be processed accordingly,” Customs and Border Protection said in a statement. 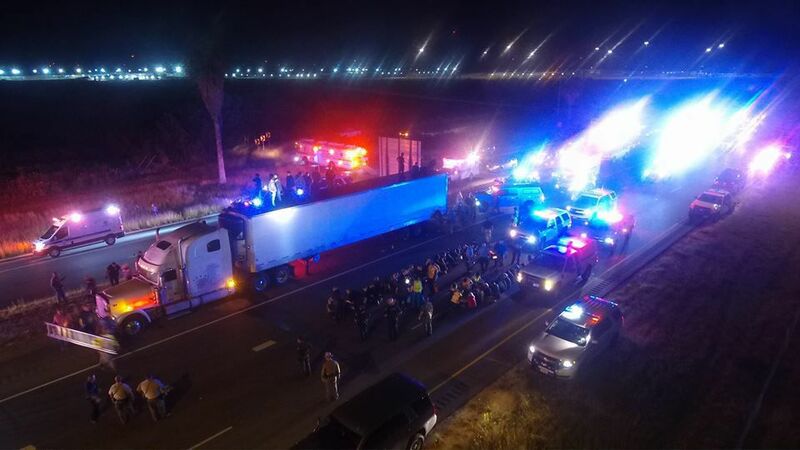 “Operation Big Rig is a call for action to be taken by anyone who witnesses illicit activity, specifically involving tractor-trailers,” Border Patrol Sector Chief Manuel Padilla, Jr. said in the release.